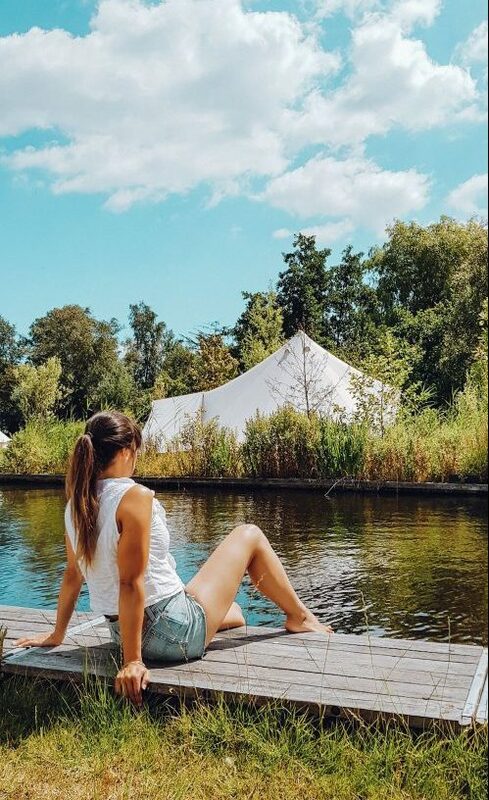 Last year we booked a weekend at Zwier, a glamping experience just outside the city of Amsterdam. Deadlines took my stress level to a high last week, and my body & mind were looking for those holiday vibes. Within 15 minutes by car, you find yourself at The Vinkeveense Plassen. A lake area with flora and fauna that feels miles away from busy Amsterdam, or any city for that matter. Zwier is located in the middle of this, and situated next to a tiny harbour with boats and canoes. Until one year ago, Zwier was a normal camping, with caravans and places to set up your tent. 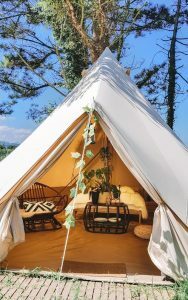 It’s a family business that has recently been passed on to the latest generation, and they decided to focus more on glamping, sustainability, and offer people from around the busy cities a place to totally relax. It feels like coming home, from home. 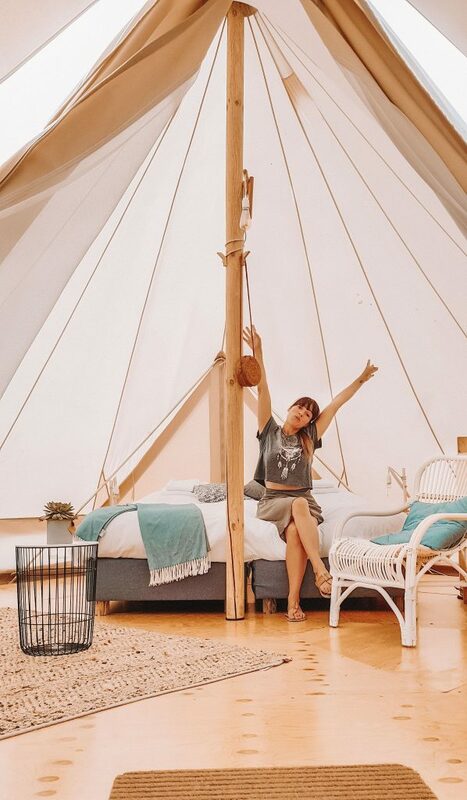 At Zwier you can stay in beautiful Bell Tents that are equipped with a small fridge, comfy boxspring beds, a small table and chairs. It feels like coming home, from home. If you want, you can also book your stay on a large boathouse or tiny island hut next to the water. The utilities are extremely luxury for a camping. Rain-shower, check. Clean toilets, (that include unlimited toilet rolls!) check. Each tent has enough space, and a feeling of privacy. I noticed that most people staying at Zwier, are aged between 25 and 40 years old, work of live in cities nearby, and have a busy profession. Burn outs, are most common between the age of 30 and 45, so it’s extremely important to give your head some space now and then. 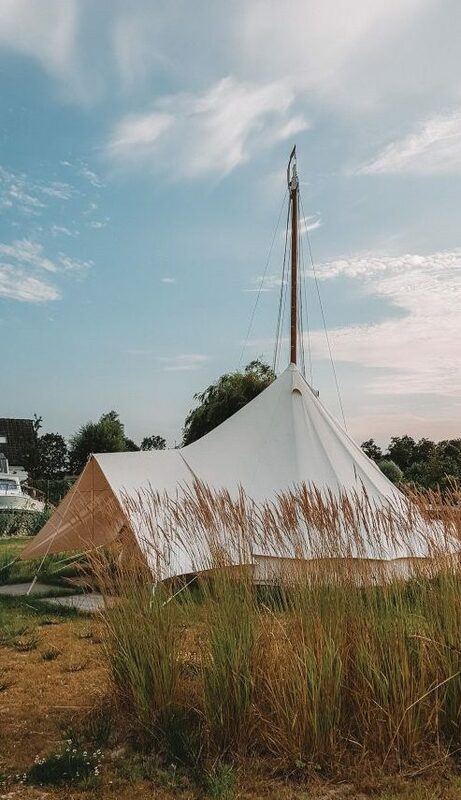 The bell tents are available from €229,- for a whole wknd (Fri-Sun) and include 2 boxspring beds, breakfast, yoga and free use of sup-boards and canoes. 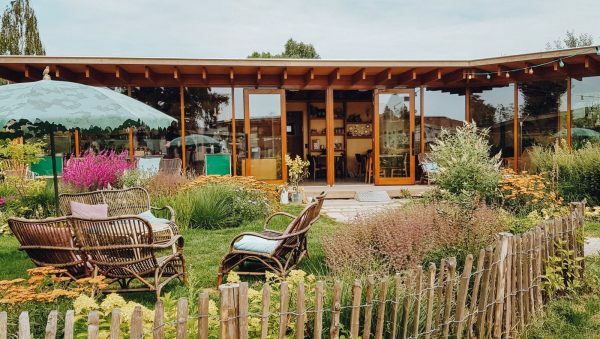 Breakfast is served in a glass house between 8 and 11am that includes fresh bread, croissants, homemade smoothies & granola, fresh orange juice and unlimited coffee & tea It’s also the community kitchen to prepare your dinner that you can pre-order at the Zwier reception, or you buy in your local supermarket. 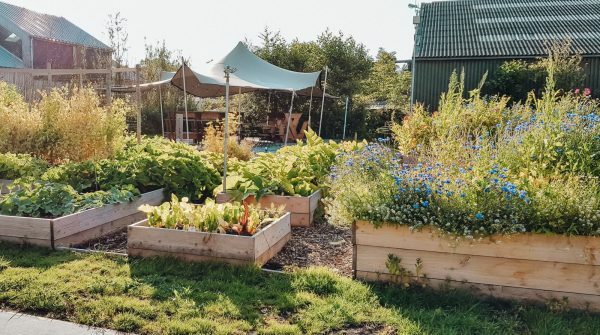 Veggies and herbs grow in the Zwier garden, and guests are welcomed to pick some fresh salad and cucumbers. 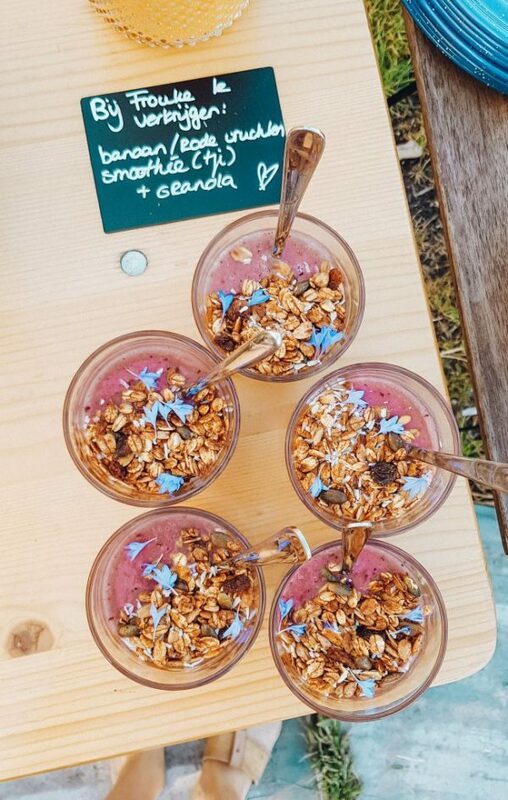 At the reception, you can buy organic ice-cream, beers, crisp and organic lemonade. So what do you do at Zwier? Mainly; relax! I saw people reading books, sunbath, girlfriends chatting away, take a plunge in the Zwier natural pool, or take a yoga class. At Zwier you can do anything that feels good. Nothing has to be done, but the options are there. You can take a sub-board or canoe for free and explore the Vinkeveense plassen. You can also rent a boat, which is great for a group of friends, for €99,- per day, or €35,- per hour. If you arrive at Zwier by car, you have the option to explore a bit further, but we loved staying in and around Zwier for the 2 days that we were there. I felt no rush to explore, just being there in the moment. 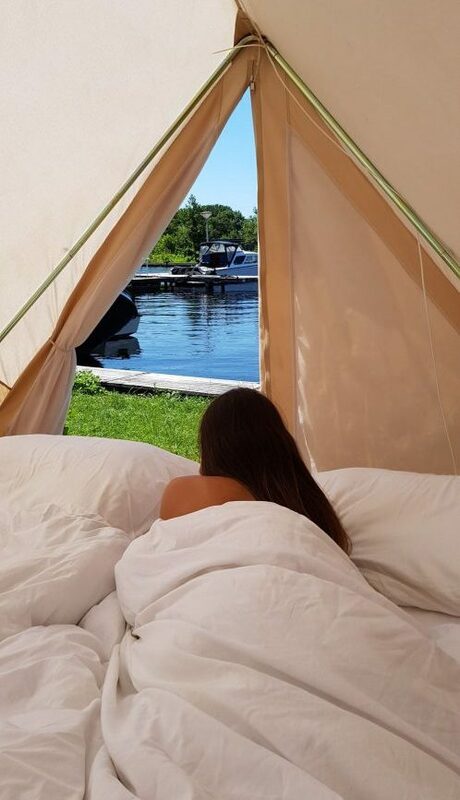 Where would you stay, tent, or boat? 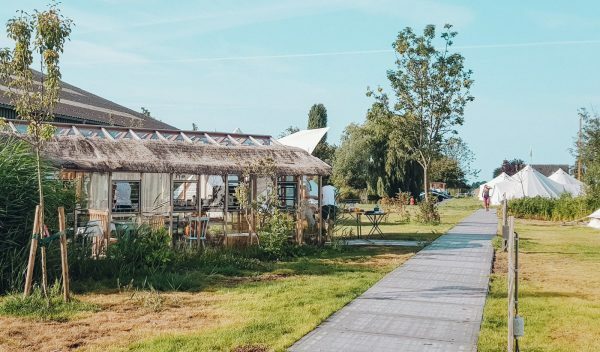 If you feel like eating somewhere else, other than Zwier, you can visit the Coffee house “De Goede Morgen” which is just 10 a minute walk away and such an amazing hidden spot. They serve breakfast and lunch until 4pm, so it’s great for a morning stroll. If you continue walking for a little longer, you’ll get to beach club Lust, where you can order a more lavish lunch (and some wine). If you come with kids, this area is also nice because of the man-made beaches, that allows shallow swimming. I must say, the water near the beaches, aren’t very clean, so be sure to shower your children after they’e been swimming. Zwier also has some nice activities planned such as 24 Hours Without. Here you are challenged to stay at Zwier’s Island Cabin, which is not located on the camping, without Wifi, mobile phone or tablet. With a basket full of organic goodies, a good book and your thoughts, you can opt for the 24hours or the 48 hours challenge. Would you dare? 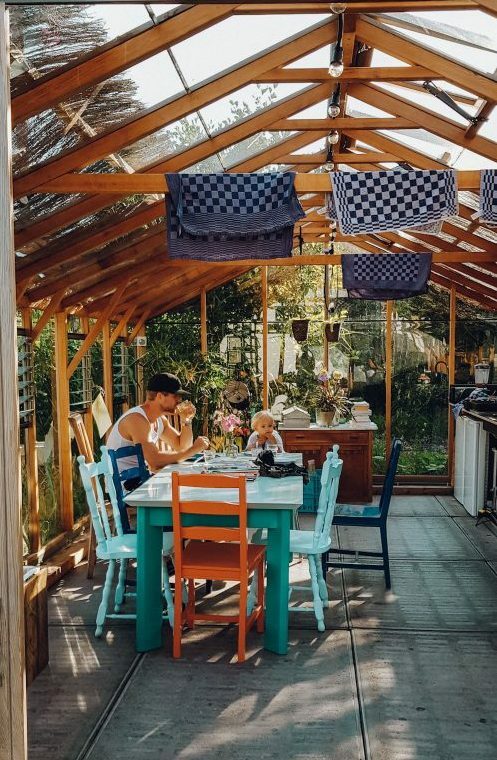 24 Hours Without is available from €175,- and includes a made up boxspring bed, transportation to – and from the island, a food basket and a small kitchen. When it was time to check out on Sunday (check out is a 4pm if you stay the weekend), it felt like the end of a holiday. I couldn’t believe I was 15 minutes away from the city, and my home. At Wander-Lust we give many tips, but this must be one of my best ones yet. So no matter who you decide to come with; your girlfriends, your partner, your colleagues or alone, Zwier will re-charge your batteries. 100%.